If you’ve been trying to make sense of the proposed national Work Health Safety (WHS) laws and can’t get any straight answers you are not alone. We’ve spoken to as many official bodies around the country as we can to get some straight answers including SA’s premier business advocacy group Business SA, WorkSafe SA, Safe Work Australia, Work Cover SA, VIC & NSW just to name a few. The short answer is no one can say for sure what will and won’t be included in the final legislation until it is finalised. 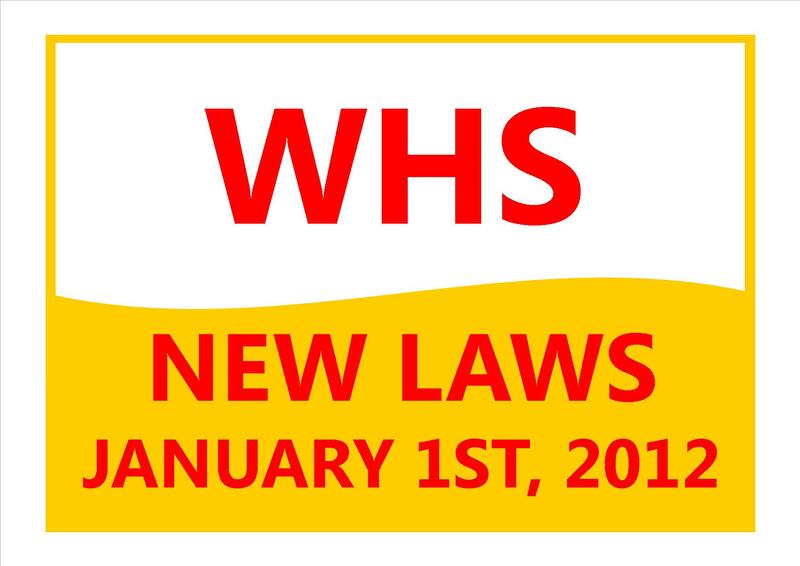 We can however give you some idea of what the new WHS laws are all about, what they will be based on, when they will come into effect, how long you will have to comply with the new laws and what you can do now to be prepared. Very few companies or official bodies are willing to do this right now but after reading all of the almost 300 pages of the model legislation, the 16 regulations the legislation is based on and most of the Australian Standards the regulations are based on, we feel confident in the advice we are about to give you. WHS is the acronym used for Work Health Safety. The proposed new national Work Health Safety (WHS) legislation is being developed to replace the existing state/territory based OHS legislation/laws. WHY DO WE NEED NEW LAWS? At present each state and territory in Australia has their own set of OHS laws, the new national laws are being developed for two reasons: 1) To implement the best safety practises in Australia, all around the country and 2) To provide uniformed safety practises all across Australia and regions governed by Australian law. WHY DO WE NEED UNIFORMED PRACTISES? Imagine you are an employee who is sent interstate for work purposes and every state you travel to has a different set of rules regarding how you should behave at work, what level of training you require and different rules regarding the responsibility for your safety. It can be mind boggling keeping up with all the differences. Now image you own a business which has locations in several states across Australia, it can be very time consuming and costly just trying to keep up with all the different sets of laws not to mention confusing. WHS will simplify these issues by ensuring the same set of rules apply to all businesses and work sites across Australia. WHAT IS WHS BASED ON? The new national Work Health Safety legislation is based on the best safety practises from around Australia and also take into consideration the Australian and or International Standards which are used as guidelines in related industries. For example the guidelines which recommend the type and frequency of Fire Training required by Australian businesses are found in AS3745-2010 Planning for Emergencies in Facilities, these guidelines are expected to be passed as law making them compulsory in all states and territories of Australia. From our understanding, this means that all Australian Standard recommendations will no longer be recommendations they will be law. This cannot be 100% confirmed until the legislation has passed which will not occur until after consultation with industry bodies, experts and leaders’ is completed. This consultation is happening right now in the last few months of 2011. Yes you can, the model legislation is currently open for feedback and comments from the public however comments have closed on the WHS model regulations. The WHS model code of practise and regulations for the mining industry is also currently open for public comment – you can access information on how to have your say here on the Public Comments page of the Safe Work Australia website. We suggest you download and read the documents before commenting. WHERE CAN I GET A COPY OF THE MODEL LEGISLATION? The model (WHS Act) legislation and the model regulations can be downloaded from Safe Work Australia website. The model (draft) documents are currently open for review and comment. They can be downloaded to your PC as PDF documents or word documents. If there is a particular part of the new laws you are concerned about we suggest you download and review the applicable content as soon as possible to ensure you have your chance to have your say. ← Daylight savings, time to change your smoke alarm batteries!